Barbacoa is a melt in your mouth, easy to cook meal that you can make in your slow cooker, pressure cooker, or in the oven! You’ll be glad to know It requires no advanced cooking skills and you can bake it in the oven or leave to cook all day in your crockpot, both ways work well. 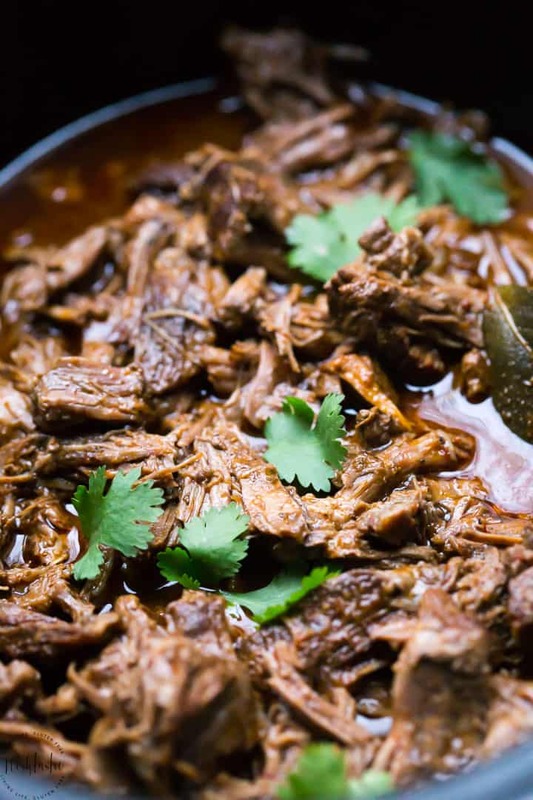 I made my Barbacoa beef in the slow cooker as I really think that’s the easiest way as you can set it and forget it, but I’ve included directions for making it in the oven if you prefer to do it that way, and you can easily make Instant Pot Barbacoa too. What kind of Meat is Barbacoa? 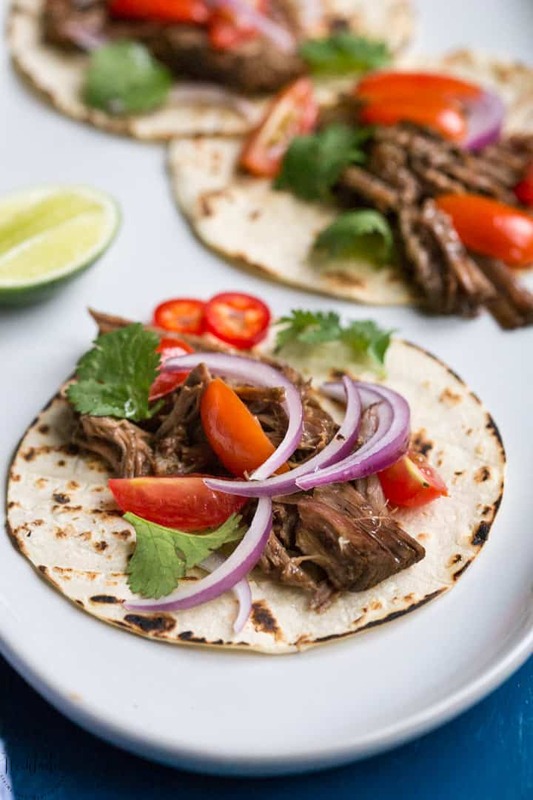 In Mexico traditional Barbacoa is usually made with lamb or goat and wrapped in maguey leaves. In the USA it’s usually with beef cheeks and cooked long and slow over an open fire pit, it’s often served with onions and cilantro. As we don’t have access to beef cheeks or goat and decent cuts of lamb are both expensive and hard to come by, we have opted for good old beef chuck roast instead as it’s easy to find and will make fall apart Barbacoa that everyone will love! What’s the difference between Carnitas and Barbacoa? Carnitas is pork shoulder that’s slow cooked often with herbs and garlic, then pulled apart and oven roasted until a little crispy. You can make tacos, salads and all kinds of yummy dinners with it! Start by browning the beef in a large skillet, browning the meat will really help the overall flavor so don’t skip this step. My tip is to use a chuck roast, it’s cheap, easy to find and creates really great results for this Barbacoa recipe. 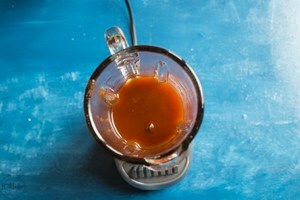 Then, add the chipotles in adobo sauce, garlic, cumin, oregano, salt, pepper, cloves, beef broth, and lime juice to a blender and blend until smooth. Now put the browned chuck roast in the slow cooker and cover with the sauce and add the bay leaves. Put on the lid and cook for for 6-8hrs on the low setting or on the high setting for 3-5hrs, or until it’s fork tender. 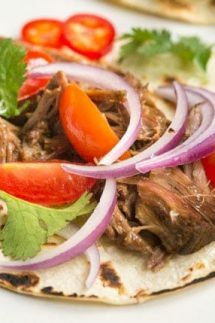 If you want directions for cooking Barbacoa in your pressure cooker or in the oven you will find all the details in the recipe card at the end of the post. The traditional Mexican way of eating Barbacoa is on top of warm corn tortillas with guacamole, salsa, onions and cilantro, that all sounds pretty good to me! 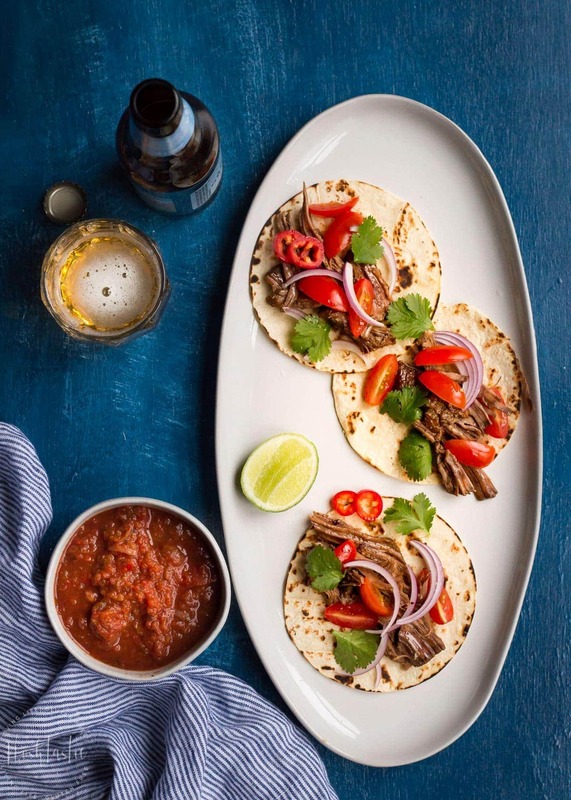 I served ours with red onion as I love the flavor of it with beef, but basically any kinds of taco fixings that your family loves will work well. The meat has a little kick but is not overly spicy for our tastes, but I think a little guacamole or sour cream helps to tone that down a bit, my children ate it with no complaints at all. 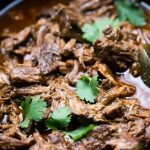 Easy Barbacoa Beef Recipe - make in your crockpot, Instant Pot or braise it in the oven! Don't miss my recipe video! you'll find it below the directions. 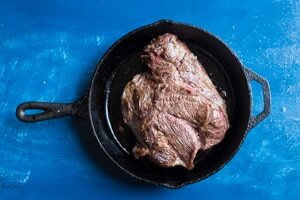 Season the beef with salt on both sides, then brown the chuck roast on either side in a cast iron skillet or similar pan. Add the chipotles in adobo sauce, garlic, cumin, oregano, salt, pepper, cloves, beef broth, and lime juice to a blender and blend until smooth. Place the browned chuck roast in the slow cooker and cover with the sauce and add the bay leaves. Cover and cook on LOW for 6-8hrs, or on HIGH for 3-5hrs. Some slow cookers run hotter than others so your Barbacoa may be cooked in just a few hours, it's best to check it as you go. 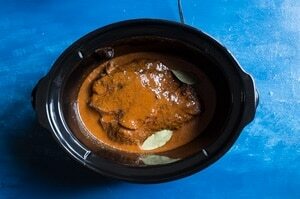 To make pressure cooker barbacoa simply brown the meat and make the sauce as before. Add the meat to your pressure cooker or Instant pot and cover in the sauce. Lock the lid, turn the steam release vent to 'sealing' and using the 'manual' or 'pressure cook' setting, adjust it to cook for 50 minutes at High Pressure. Brown the chuck roast on both sides in a Dutch Oven and remove the meat. Deglaze the Dutch Oven with the sauce, then add the meat and bay leaves and put lid back on. Cook for 3-4hrs or until meat is tender and can be pulled apart.